This section walks you through the steps of registering an application to integrate with Facebook. If you do not already have an account with Facebook, go to https://www.facebook.com/ and register one. Then go to https://developers.facebook.com/, and click Register Now button at the top of the page. Facebook walks you through a series of dialogs, complete the Accept the terms, Verify your account, etc. From https://developers.facebook.com/ click on “My Apps” at the top of the page to go to the application dashboard. The dashboard shows a list of applications that the developer has created. You haven’t created any applications yet, so the list is empty. From the application settings page, you can configure various details about your application. The main thing to note from the application settings page is the App ID and App Secret near the top. These values are your application’s credentials to Facebook. 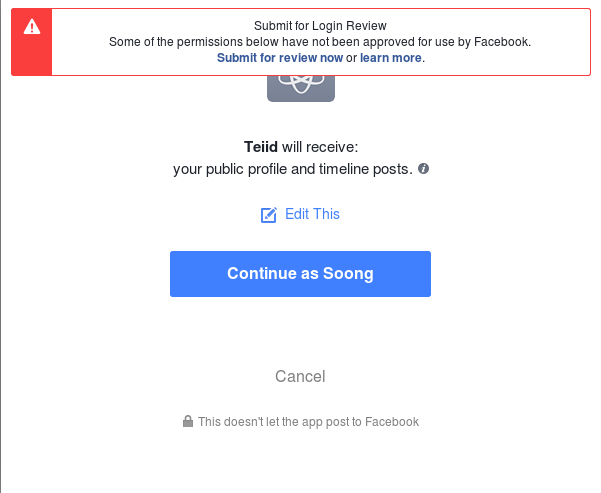 You need these credentials to do almost anything with Facebook, including going through the OAuth authorization flow in the following sections.